Fixed bug: SimpleProgramDebugger failed to remember the last size/position of the main window if it was not located in the primary monitor. 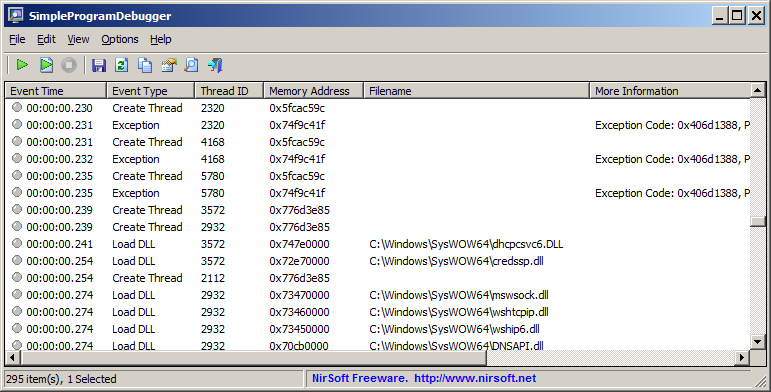 The ID and the .exe file of the debugged process are now displayed in the window title. A file named SimpleProgramDebugger_lng.ini will be created in the folder of SimpleProgramDebugger utility. After you finish the translation, Run SimpleProgramDebugger, and all translated strings will be loaded from the language file. If you want to run SimpleProgramDebugger without the translation, simply rename the language file, or move it to another folder. SimpleProgramDebugger is also available in other languages. In order to change the language of SimpleProgramDebugger, download the appropriate language zip file, extract the 'simpleprogramdebugger_lng.ini', and put it in the same folder that you Installed SimpleProgramDebugger utility.